I want to let everyone know that we moved to Boulder, CO this summer and Jake is loving life in the Rocky Mountain Foothills. They have an off leash program here, where as long as Jake stays within voice and site, he can roam the trails in many of the parks. 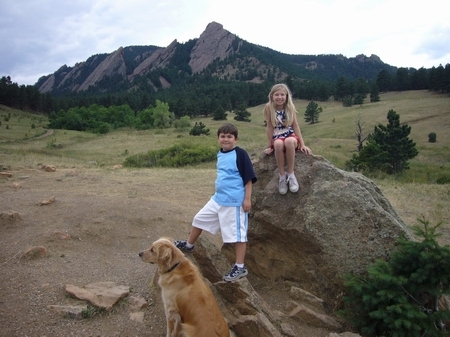 I have attached a picture of Jake and the kids at Chautauqua Park- home of the Flat Irons, one of his favorite places. Jake is such a wonderful family dog - he just can't stand not playing with the kids. We had some snow last week and he would not come inside! We are constantly getting compliments on what a beautiful dog he is! Thanks for helping us find Jake. We just wanted to let you know that Jake is doing great! He is such a sweet boy. He has settled in very well. All last week he played with Jessica, Ben and their 4 cousins visiting from Scotland. 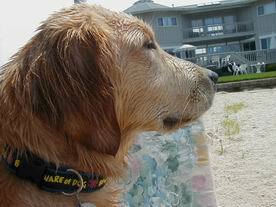 This weekend, we took him to our friend's beach house in Northport. 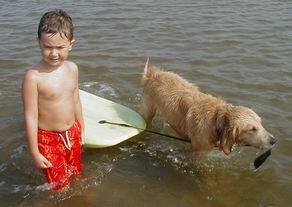 He loves the water and kept pulling Jess on the boogy board. He even swam after the tube the kids were on and pulled them in! We are so glad we have Jake! He has made friends with a four month old labradoodle up the block and we plan to have many play dates with Teddy. He loves all the other dogs he meets and gets along well with my Mom's dog - very important.